Criticism of Liverpool manager Brendan Rodgers is unfair, according to Norwich City boss Alex Neil. 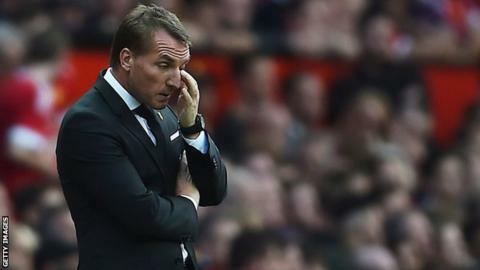 Rodgers's tactics were questioned following Saturday's 3-1 defeat by Manchester United, their second Premier League defeat in a row. "Brendan Rodgers has proved himself a manager," said Neil, whose side visit Anfield on Sunday. "He nearly won the league with Liverpool. He's done fantastically well as a manager in his career." Rodgers is the first Liverpool manager since the 1950s not to win a trophy in his first three seasons, after finishing seventh, second and sixth in the league since his appointment in 2012. The Northern Irishman, 42, has spent more than any of his predecessors, having invested over £77m this summer on Christian Benteke, Roberto Firmino, Nathaniel Clyne and Joe Gomez. Liverpool have scored only one goal and taken one point from their past three league games. But Neil said: "I don't buy this, 'Liverpool are in crisis'. "Liverpool have got good players, they're well managed and they'll be a danger to any team in the league." Norwich, promoted from the Championship last season, are currently level with Liverpool on seven points.